Have you ever wished that you could understand what your cat was trying say? When your furry feline friend chirps or chatters, what is he trying to tell you? When she curls her tail a certain way, is she afraid or relaxed? Knowing how to read a cat's body language can tell us volumes about what he or she is trying to say to us. Being fluent in feline will help us make them feel more at ease - and therefore increase their chances of being adopted to the perfect home. It aids in providing better care and deepening the bond of friendship with our feline companions. The course below takes you through the three forms of feline communication: vocalization, body language and scent. Each section provides descriptions of the various forms, along with photos and videos that help you translate what the cat is conveying. Throughout the course, you can test what you learned by taking mini-quizzes. At the end, you will have a chance to earn a certificate of attendance by taking a graded quiz (a passing grade is 70%). The course will take you about 70 minutes to complete - but you don't have to do it all at once. If you want to take a break, you can leave the web page and whenever you are ready to go back to it, you'll be asked if you'd like to resume where you left off. Are you ready to parlez-vous puddy-cat? Click the button! Click the button below for six fun exercises to test what you just learned. You may want to have a sheet of paper ready to jot down your thoughts as you click through the presentation. In addition to her behavior consulting service, Dr. Krebsbach is a veterinary consultant for Maddie's Institute and the Humane Society Veterinary Medical Association, a featured speaker for professional and animal rescue organizations, and author of several articles on animal behavior. In addition, she is the founder of Dane County Friends of Ferals and has volunteered her services to several animal rescue organizations. For these efforts, Dr. Krebsbach has been recognized with various awards. Serving on the Executive Leadership Team, Dr. Peek is a major force at Maddie's Fund®, overseeing Maddie's® education programs, guiding decisions on veterinary school grants and guidelines, and advising foundation staff on veterinary-related issues. Dr. Peek's goal - to encourage veterinary schools to provide professional training and support to animal shelters and to inform them about new advances in shelter medicine - fits perfectly with the mission of Maddie's Fund. She has been affiliated with the foundation since its inception. Dr. Peek has practiced small animal medicine and surgery since her graduation from Cornell's College of Veterinary Medicine in 1996. 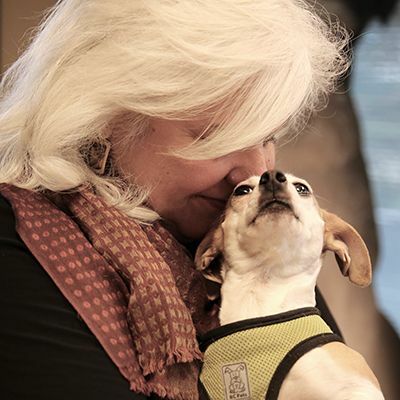 In addition to her hands-on work helping animals feel better, she provides spay/neuter and adoption assistance to several animal welfare organizations in her community. Dr. Peek and her family live in the Midwest with two Collies from a Collie rescue, Anna and Juno; three beloved "foster failure" cats, Skittles, Daquiri and Pursnickitty; an adopted English Spot rabbit, Lovey Hoppykins; and Lewi, a 30-year-old American Paint Horse. Our sincerest gratitude goes to Jacqueline Munera and Carol Bynes, authors of What is My Cat Saying for granting us permission to use several of their video clips. Thanks also goes to Joan Orr of Doggone Crazy for allowing us to use the "cheek to tail rub" video clip.